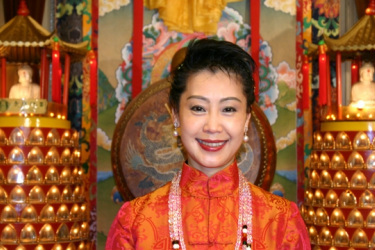 As current lineage holder and spiritual leader of the Fifth Stage of Black Sect Esoteric Buddhism, Her Holiness Khadro Crystal Chu Rinpoche teaches all of the classes of the Two-Year His Holiness Grandmaster Lin Yun Feng Shui Certification Program®, the Feng Shui workshops, the meditation retreat and spiritual growth teachings. Designated by H.H. the late Grandmaster Lin Yun as his successor, H.H. Khadro Crystal has become the only source of the entire teachings of Black Sect Esoteric Buddhism. In 1998, H.H. Khadro Crystal was recognized and consecrated by His Holiness Lungtok Tempai Nyima, the supreme leader of the Tibetan Bon tradition, and honored with the title of Khadro Rinpoche. Khadro means the highest female position in religion and Rinpoche means a precious spiritual teacher. For more than three decades, H.H. Khadro Crystal studied and worked closely and extensively with H.H. the late Grandmaster Lin Yun. The thorough training and tutelage she received under H.H. Grandmaster Lin Yun has made her the leading authority on all of the Black Sect Esoteric Buddhism teachings, a cultivated high-level spiritual teacher, a meditation master, and an experienced and authoritative Feng Shui educator. H.H. Khadro Crystal is also an international speaker, giving lectures, workshops, spiritual growth and meditation retreats, Feng Shui certification program, and providing Feng Shui consultations across U.S.A., Asia and Europe. In the past two decades, she has been invited to give lectures to the staff members of the United Nations, New York University, Dana Farber Cancer Institute of Harvard Medical School, University of London, George Mason University, Taiwanese-Canadian Cultural Association, Rotary Clubs, six International Feng Shui Conferences, and so forth. H.H. Khadro Crystal’s teaching style is structured, systematic, and full of clarity. Under her mentorship, students will learn the most authentic and complete teachings of His Holiness Grandmaster Lin Yun, Black Sect Esoteric Buddhism Feng Shui, various meditation methods, and the techniques for personal transformation and spiritual growth. Upon completion of the Two-Year Feng Shui Certification program, all graduates will be Feng Shui experts who are able to practice Feng Shui independently and confidently. While studying in the program, students will enjoy a rewarding learning relationship with H.H. Khadro Crystal as well as a strong connection with the Black Sect Esoteric Buddhist lineage. We plan to add more qualified teachers to the faculty team in the future.